Here is an interesting product from Aroma Essentials. It is their Rose Quartz Post Bath Essence. Healing with quartz crystals is becoming popular nowadays. But this is the first time am seeing quartz being used in a skincare product. Also post bath essence is a new thing. This product is a new launch by Aroma Essentials and let’s see how it performs. Pink rose quartz brings the energy rays of determination, commitment and caring. It’s soothing color calms feelings of anger or resentment. And can aid efforts to meditate and reflect. Pink is the color of love. Rs.350 for 60ml and Rs..550 for 120 ml. Aroma Essentials Rose Quartz Post Bath Essence looks brown in color and has a shimmer to it which make it looks luxurious. The consistency is like oil. It has a strong scent which is difficult to describe. A mix of rose and vanilla. And maybe some of rose quartz. Am not sure. I haven’t smelled anything like this before. Some might find it calming and relaxing. Some might find it little strong. I have mixed feelings about it. Since its a new scent for me, am still getting accustomed it. But sometimes I do feel that it relaxes my mind and body. Aroma Essentials Rose Quartz Post Bath Essence is meant to be used after shower like a post bath oil. 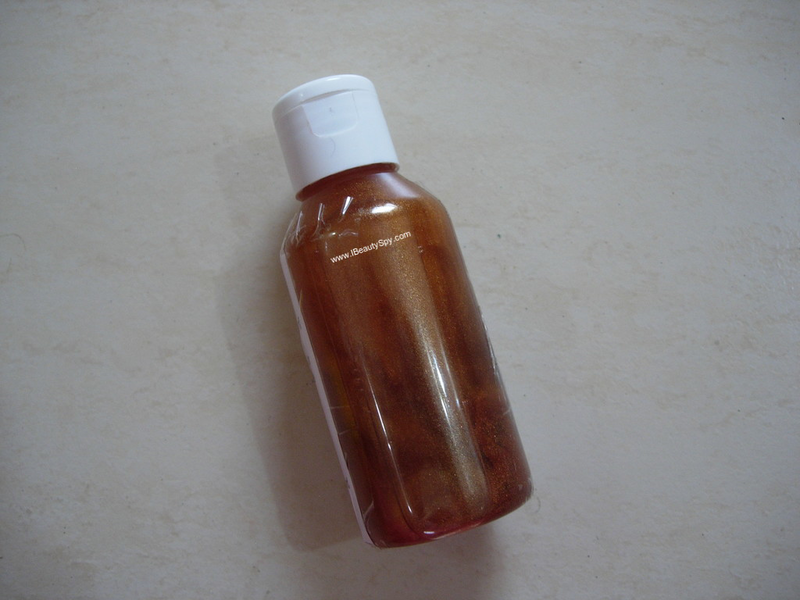 The product is named as essence only because it is more concentrated than usual after shower oils. You just need a little amount of this oil and apply all over. You will be enveloped in a blanket of roses immediately. The oil has a light consistency and doesn’t feel heavy or greasy. It gets absorbed easily but still nourishes skin well. It feels soothing on the skin and prevents dry patches. If you have any skin irritations, it will help to calm down. 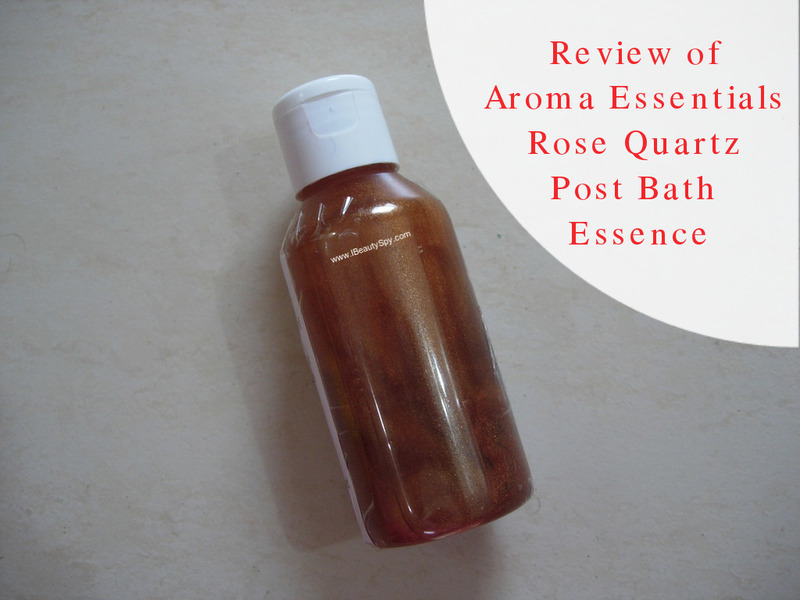 I have been using Aroma Essentials Rose Quartz Post Bath Essence for about 5 weeks now and I can see a good improvement in my skin tone. It has removed tan and lightened pigmentation on my hands and feet. My hands feel so smooth and lightened. I think the combination of rose quartz and gold dust works. Pink rose quartz is also supposed to having healing properties. It’s interesting to have a bath oil with such healing properties as well. * Innovative product made from rose quartz essence and gold dust. * Bath essence is more concentrated than a bath oil and shows faster results. 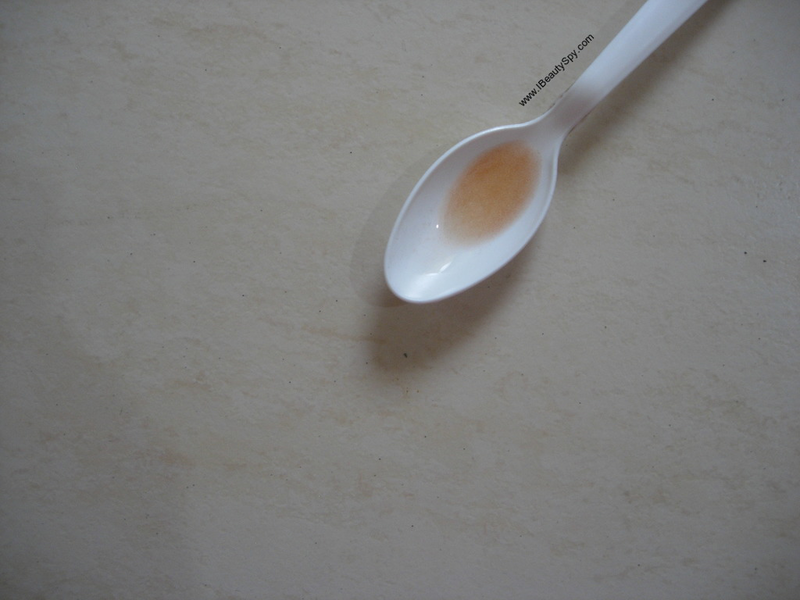 * Light oil consistency which gets absorbed easily. * Nourishes skin and prevents dry patches. * Removes tan and brightens skin. * Pink rose quartz has healing properties. It contains rose quartz and gold dust. So the price is justified. Aroma Essentials has done a fantastic job yet again with this innovative product. 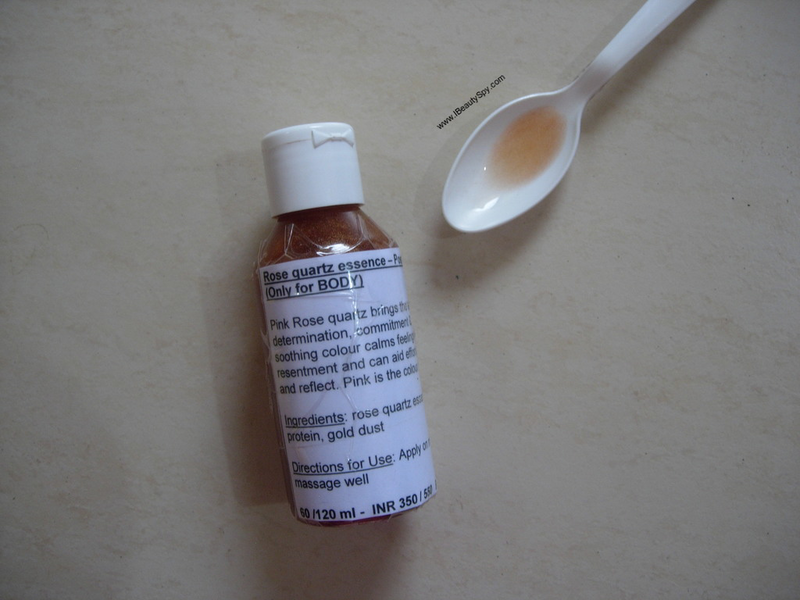 Using rose quartz in skincare and coming up with a bath essence. If you are looking for something more concentrated than a usual after bath oil and if you are struggling with issues like pigmentation, uneven skin tone, then you can definitely try this. * Auravedic Kumkumadi Oil | Comparison with Auravedic Skin Lightening Oil – Which One Should You Go For?